"The movie that'll have you rolling in the aisles." Up in Smoke is a stoner movie that got its debut in 1978. 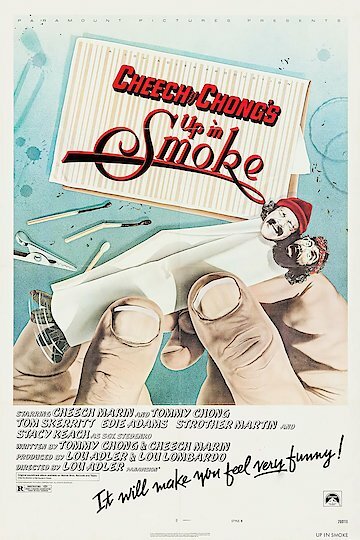 This comedy details the life and times of two completely different strangers, (Cheech and Chong). In this movie, Cheech is driving along when he sees a big busted woman trying to hitchhike and he then turns the car around to pick this woman up. Come to find out the woman was Chong disguised as a woman in order to catch a ride with somebody because his car broke down. We see that they have one common likeness that makes these unlikely pair friends, and its marijuana. The two jobless men try to score some dope throughout the movie. They end up going to Strawberry's house to try to get some weed, but it turns out to be a long day before they can get high. Strawberry who is an ex Vietnam veteran leaves with Cheech to get some marijuana, and once gone Strawberry's house gets turned into some kind of drug party. The party gets raided and Cheech has to get Chong out of the house before the cops arrest him. They eventually play in a band together and go on the road to play at a concert. Cheech and Chong drive a van made out of marijuana across the Mexican border, and have to elude the cops trying to bust them. They come face to face with the cops trying to catch them a couple times throughout this movie. Unbeknown to them that they were even driving a van that is made of weed. Since they didn't know about the van, they continue to look everywhere to try and find some smoke, not knowing it's right under their noses. They will eventually find a way to elude police and their dogs. They take the viewers on a comedic ride from begriming to end. This was a very popular movie to the hippie generation in the late 1970's to the 1980's. Up in Smoke is currently available to watch and stream, download, buy on demand at Hulu, EPIX, IFC, Amazon, Vudu, Google Play, iTunes, YouTube VOD online.